When you’re walking through deep ice and snow in a penguin colony, you watch where you tread in giant knee-high all weather boots that have non-slip soles. I’m not talking about a field of two or three penguins here and there. I’m talking about a scoop of rock and land inhabited by more penguins than there are people on Fifth Avenue. And that means a lot of poop on ice. One thing scientists study is penguin poop - it lets you know what they are eating - if the poop is white, they are eating fish. If it is red, they are eating krill. If it is green, the penguin is starving. (I saw one chinstrap penguin lift his wings, lean over a bit and let fly a pile of green poop. Whoever was in the way, tough.) This starvation happens in periods when a male penguin cannot leave the egg he has been sitting on between his short little legs - the female goes back and forth to seek food and maintains the nest. But he sits and waits like a good daddy. Sometimes he is required to sit for up to six weeks without eating. It’s a penguin’s life. As courtship begins, a male penguin wins his female because he has brought sufficient rocks (in his beak, one at a time) to build the nest for the egg. The gentoo, or fatter penguin, produces only one egg. The gentoo is the most faithful spieces and stays close to shore. It tends to be a stay at homer, rather than swimming away at sea for the winter only to return at this time to their very same nest (how one knows, I have no idea) to wait for the very same lady penguin he mates with every year. This is true. Penguins are faithful to mates and location. Now if a male returns first and gets restless and begins to worry if his female is not going to return (she may have been killed at sea) he might go ahead and take on a new mate. If the original female does happen to return late, then there is a horrible fight between the girls. It’s not the males who fight, just the girls. Learning about penguin culture is fascinating. The best way to do this is just sit on the snow and watch. Yesterday, Thanksgiving Day, about 10 in the morning, accompanied by soaring and diving birds such as southern giant petrals, Blue Eyed shags, skuas (the garbage men of Antartica) and storm-petrals, we had gotten well south of the 60th parallel and saw our first iceberg - a huge monster bigger than the FedEx Forum but flat on top like a huge plateau. These didn’t look any different than the icebergs of Greenland with the same sapphire blue color at the water’s edge. As we passed this first one on the starboard side, we quickly ran to the port side and saw many more gigantic bergs and amazing snow-covered rock formations of the islands. In an ice floe cracking a part, the captain spotted a sleeping seal, a giant one, and we, the huge ship crept up to it without disturbing its sleep and took a thousand pictures of a dot as we got closer. The seal lifted its head once but decided to stay where he was. We were no threat in his waters. We then approached the South Shetland Islands, our first sight of Antarctic land. (Cheers! It meant we were in a protected area and the rough seas would be left behind. We had arrived at our playing field.) 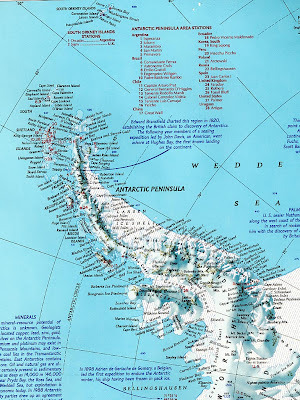 William Smith had first discovered this archipelago (known as the Antartica peninsula) in 1819. But thousands of American and British sealing vessels heard about the wealth of fur seals breeding there. Within two years, they had completely eliminated them all so women and men could wear sealskin coats. Isn’t that typical? We hiked up and down ridges in the snow and most of us were puffing like a badly stoked fire. Funnily, Penguins, as they are want to do, started following us in our big red jackets and wool caps and black boots and cameras with long lenses. Imagine 100 people trudging in the snow and oogling. It’s like we are afternoon entertainment for them. We were warned not to let a Kleenex or a rubber band or a lens cap or a glove be left behind. Be pristine and thoughtful or we could harm an innocent penguin's routine for survival. And they are innocent and beautiful. My favorite penguine habit was when one waddling along at a pace falls flat on his chests/stomachs and then sort of propels themself along with his feet. Many penguines climb to the top of the highest rocks and cliffs to belly flop down it like we do on sleds. Or one stretches his necks tall as a swan and then doubles down with his heads to peck at their upper chest. Penguins cannot bend their bodies. They are stuck with a trunk and yet they seem graceful and can get just about anywhere they wish with more grace than the average Joe. The landing site was not huge but every inch was packed with penguins - and there was one fat, lolling, lethargic, happy hairy elephant seal right in the middle of one of the rookeries on the beach at a lake. The gentoo and chinstrap penguins (they have a black strip under their chins that looks like a helmet strap) are busy staking claims to their piece of ground. They set up nests within pecking distance of each other. There are three penguine species on Antarctica - today we were introduced to two, with the Adelie penguins yet to come. We have penguin experts on board and two American girls from the non-profit Oceanites who are counting nests and eggs. Two things about visiting penguin environments - 1) they stink and 2) they’re noisy. Although a group might number a hundred or so, every now and then a male will stretch up high, put his beak in the air and shake his shiny neck as he makes loud duck and bird sounds. He is saying, this is MY HOUSE. Don’t come close. Then everyone choruses a opinion. Yet, there is no animosity between species or within species - except, as I pointed out, between the females. Of course, in penguins, you can’t tell which is which - and both sexes incubate the eggs between their legs. All penguins go through a traumatic time each year when they molt feathers - called a catastrophic molt - the penguin stands in one place for three weeks as he loses his feathers and new ones come in. The arch enemy of penguins are the brown scuar who will steal an egg faster than a pickpocket. We saw one do such a trick, break it open, and feast. What can you say? It’s nature at work. We will see more penguins as the week goes on and if the weather calms down so we can get ashore. Right now it’s snowing thickly and rumors are a storm is coming. Batten down the hatch.